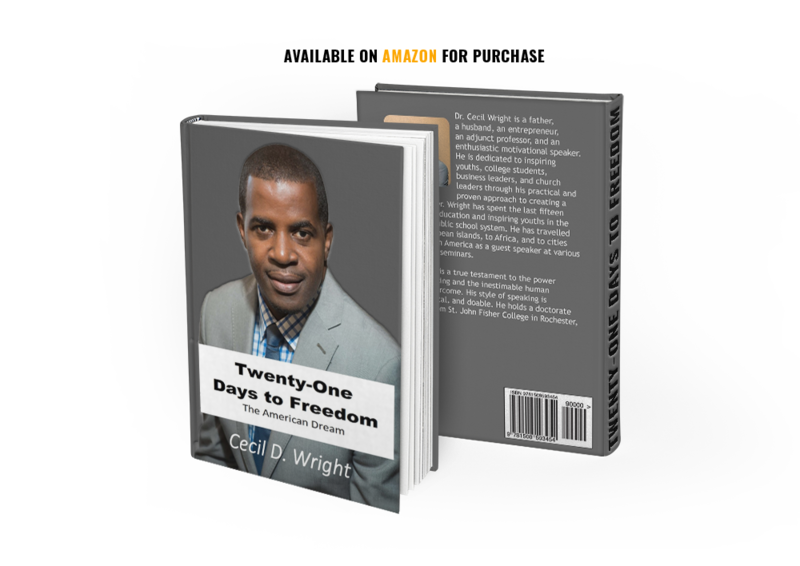 In Twenty-One Days to Freedom, Dr. Cecil Wright clearly illustrates his ability to beat the odds. Using his life and the life experiences of the fifty-one men interviewed, Cecil has proven that when the human spirit is sparked with desire, it ignites a passionate fire that makes accomplishing your goals and aspirations inevitable. Through the tenets of patience and shameless perseverance, this book teaches us that we all have the ability to overcome circumstances as long as we keep our eyes on the ultimate prize….. The pursuits of family, faith, and freedom are the essential elements that make every struggle endured worth the pain. This book is designed to engage, educate, and empower the common person to pursue uncommon dreams with a determined spirit. More than a memoir, Twenty-One Days to Freedomoffers enlightenment and encouragement. Cecil shares with us the story of his journey—the road he traveled from undocumented immigrant to prominent citizen. I found every chapter in this book to be intriguing and inspiring; I’m sure you will too. We are eternally grateful to Dr. Cecil Wright for giving us all hope; God’s blessing is upon him. This book will change the lives of everyone impacted by the immigration system, but more so, it gives us insight on human courage and faith in the American dream. Just only yesterday I was contemplating doing somethings that most can’t comprehend. Feeling like my 10000 hrs (Malcom Gladwell) is a joke…feeling purposely, a failure and just completely feed up with life because it’s obviously build for me to fail… This book made me feel many emotions. Anger, sadness and mostly the feeling helplessly. Dr. Wright I respect you 100% more after reading this amazing heartfelt book. I will keep the faith a little longer because of you. “The cell was dark, but the glare of light from hallway gave us enough light to see our hands.” “Fear owned me. I could not pray. My mind drifted into territories it had never been before.” Dr. Cecil Wright. Awesome story! Everybody need to get a copy of this book. “Twenty-one days to freedom.” Well done Dr. Wright! A few days ago, Vassell Claudette sent me a video about a man’s faithful journey through the immigration process… (never heard of him before watching that video) thought about him all day. The next day I got a package in the mail from my dear Sister Althea Robinson guess what it was!!??? His book seen below. See why I believe in the law of attraction!!! “This book is designed to engage, educate, and empower the common person to pursue uncommon dreams with a determined spirit. BE INSPIRED. BE RENEWED. BE TRANSFORMED.